When I was given the assignment to do a hands-on review of a VIZIO SmartCast wireless soundbar system, the SB4551-D5, I was a bit apprehensive. I’ve always considered myself a bit old school when it comes to home theater; I’m used to the receiver doing its job routing the video signals and amplifying the audio, and the speakers doing their job moving air. Based on this idea of a division of functions, and earlier unreliability of wireless audio, I’ve always had an aversion to it in my home theater setup. My main concern with this assignment was that my belief of wireless audio being unreliable or lower quality compared to wired home theater would be proven true, and it might color my review negatively. Fortunately, as you’ll discover as you read on, I had an entirely positive experience with this system. Setting up the soundbar system was easy and straightforward, though, in my eagerness to get it set up, I initially had the HDMI ports reversed. That’s totally my fault; I was too focused on setting up my new toy to do it right. Once I got the soundbar properly plugged in, which consisted of just two HDMI cables (one in from my Xbox One, which takes the input from my cable box, and one out to my display) and the power cord, I set up the subwoofer and rear speakers. That setup was even easier; the included RCA-tipped speaker wires are color-coded, and are long enough for nearly any setup where the subwoofer will be under the couch. Last, of course, was the power cord for the subwoofer. The next step was even easier; I took a deep breath to quell my prejudice of wireless audio, and downloaded the SmartCast app to my Android phone. I found it quickly, it installed quickly, and the initial setup of the app was also quick and easy. 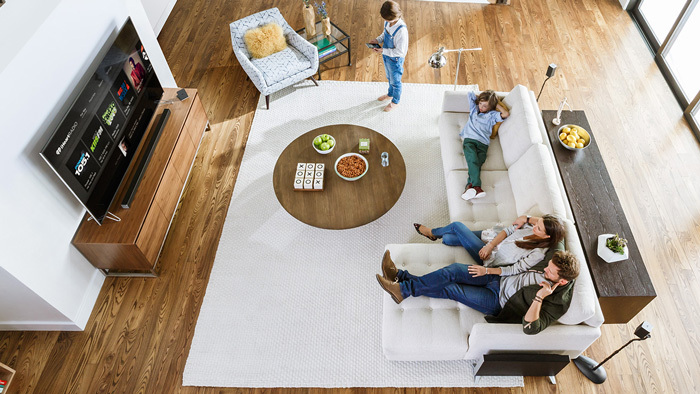 The Soundbar itself is equipped with 802.11n Wi-Fi and Bluetooth 4.1 connectivity. Ethernet is also onboard if you prefer a wired network connection. Once the app setup was complete, I started browsing its functionality. It offered me full control of the audio, including bass and treble levels; center, surround, and subwoofer volume; and surround balance. The app also has options for surround sound on/off, TruVolume on/off, Night Mode, and EQ mode (Movie/Music). Additionally, the app allowed me to power the system on or off, change the input, and much more. My last step in the setup was to configure the audio settings. I went to Netflix through my Xbox One, chose the first audio-intensive movie I know well, which was The Matrix, and parked myself in the sweet spot. In my arrangement, the left rear speaker was a bit farther than the right due to a lack of better placement options, so I simply adjusted the balance a bit to the left via the phone app until the rear speakers sounded even. Then, I lowered the subwoofer volume a bit, because I grossly underestimated what a flat 8" subwoofer under my couch would sound and feel like. The soundbar itself needed no adjustment. 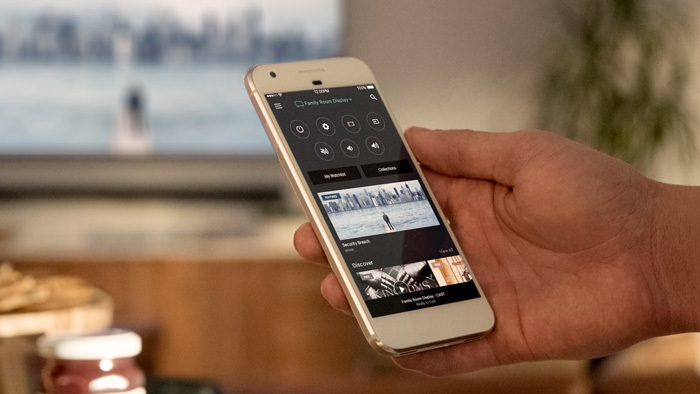 For the record, aside from volume control, I hadn’t yet used the remote that was included with the system; that’s not to say I didn’t eventually use it, but there was such a range of control through the app, it was almost unnecessary. First, I think it’s important to note that with this soundbar system, as with any audio system, it is crucial that you take the time to set it up and configure it properly to the needs of your listening area. 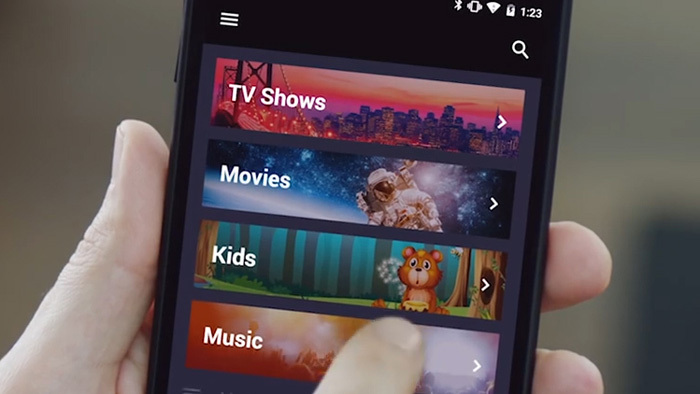 However, I used the system for a variety of content, including casting YouTube and Pandora, viewing Netflix, and basic DVR viewing. For TV and movies, the system did everything it was supposed to, and more. Bass was rumbly, but not overpowering; sound effects were clear and dynamic; and dialogue was certainly intelligible. Music is something for which I have a more critical ear; I’ve had music playing nearly perpetually since before I can remember, so when I cast Pandora from my phone to the system, or through the Xbox One, I paid close attention. The stereo separation was very clear, which I was a bit surprised about from a soundbar only 45" wide that I was sitting about 12' away from. I was able to feel the bass without it overpowering the rest of the audio. For fun, I put the system in Surround Mode while listening to music (something the purist in me never would have done, but if I’m going wireless, I may as well shuck that husk too), and the added channels made for a very enjoyable experience: it was as if I was in the middle of a stage with the band surrounding me. While surround sound may not be true to the recording by nature, it’s certainly fun to experience every now and again. I was also pleasantly surprised that, for TV and DVR viewing, or even streaming YouTube, I didn’t need to adjust the delay at all. Considering how my cable box runs through my Xbox One, through the soundbar, to the display, I expected some delay, but I was watching lips and listening closely, and didn’t notice any delay issues. I know from experience that sometimes compromises must be made, particularly in the shared areas of the home; when I married, I had to switch from my powerful 5-channel setup to a 2-channel setup, using my former rear speakers as my only speakers. For anyone in a similar situation, this soundbar system would be a good middle-ground. The black soundbar is nearly invisible in front of my display, the subwoofer is totally unseen under the couch, and the rear speakers are small enough that they can easily go unseen. 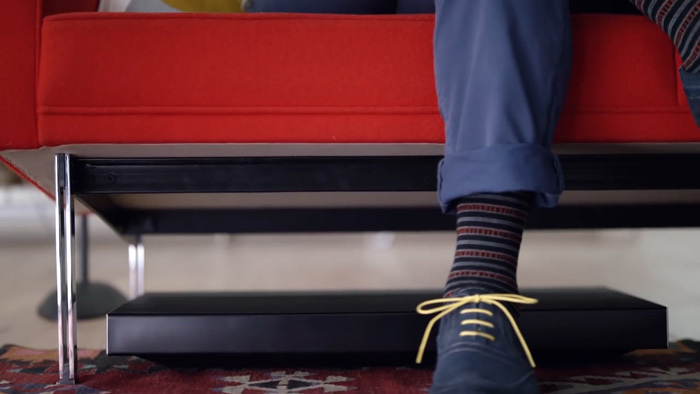 At less than 3.5" tall, the subwoofer will fit under nearly any couch, but stands are included if you prefer to place it vertically. 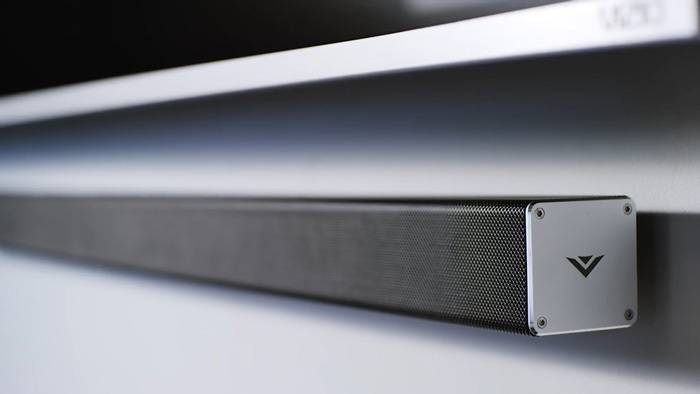 Additionally, if you so choose, the rear speakers and the soundbar are wall-mountable with included hardware; you just have to provide the screws to attach the brackets to the wall—one per rear speaker, two for the soundbar. As for the looks of the system, each piece is black and silver. 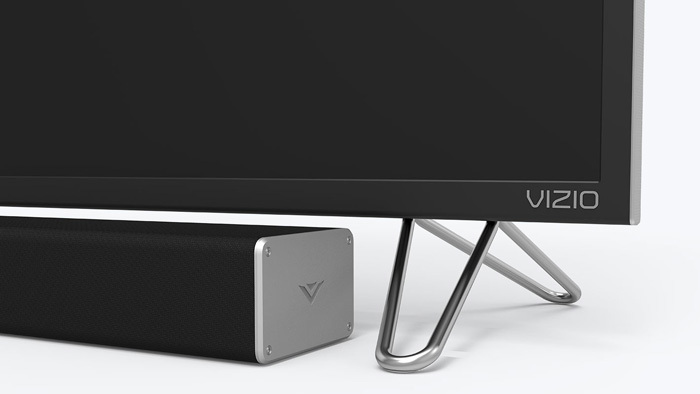 The left and right outer sides of the soundbar, the top of each satellite speaker, and each long end of the subwoofer is silver, and all silver surfaces (except those on the subwoofer) are adorned with the VIZIO logo. I think these design features would fit well in many home theater settings, since the entire system could be either prominently or discreetly displayed. Wireless audio has come a very long way since its inception. I worked in sales during the early days of wireless audio, and remember referring to it as “temperamental.” Nowadays, as this system proved to me, streaming video and audio over Wi-Fi is a viable option in home theater. In fact, if I ever need to replace my current system, I will certainly look for something with wireless capability. Additionally, the old adage of “don’t judge a book by its cover” comes to mind when I think about the couch-shaking power that the subwoofer delivered. 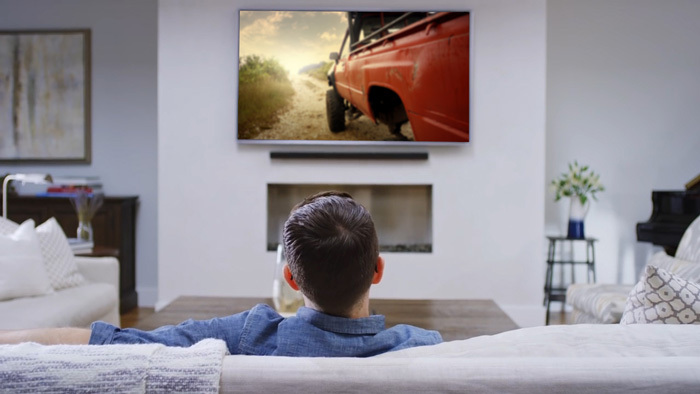 Suffice it to say, I thoroughly enjoyed my time with the VIZIO SB4551-D5. How about you? Care to share your first, or any, experience with wireless audio/video or streaming? Feel free to do so in the comments section below! And, as always, contact the friendly, knowledgeable sales staff at B&H via phone at 800-606-6969, chat, or email, or come into the B&H SuperStore for a demo.